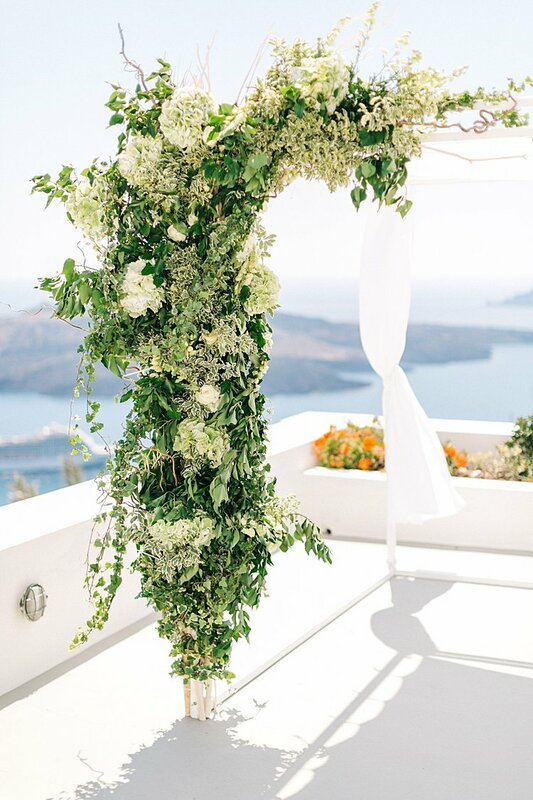 In the five fabulous years since Smashing The Glass’s inception, having lovingly blogged hundreds of incredible real Jewish weddings, we have always ALWAYS wanted to blog a Jewish wedding from Santorini (surely one of the most magical places on earth) and today the day has finally come. 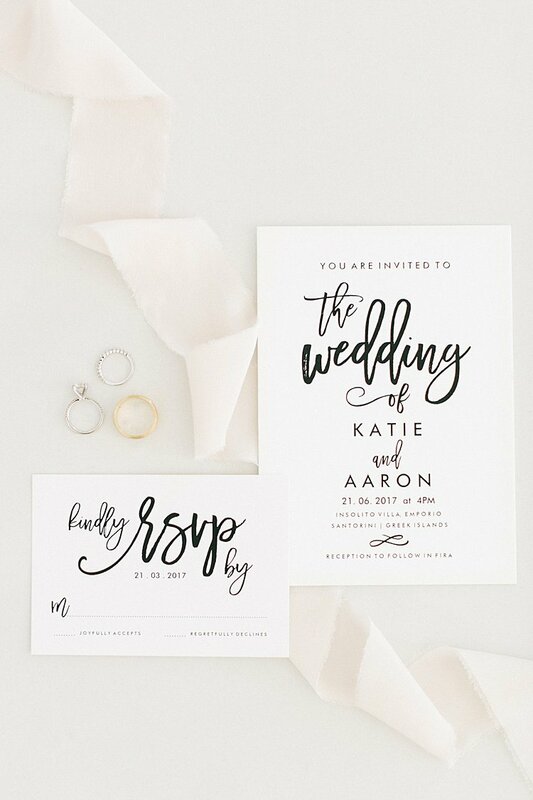 and seriously guys… this wedding is EVERYTHING. 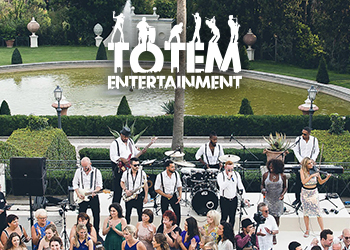 It’s a destination Jewish wedding that has us absolutely picking our jaws off the floor. 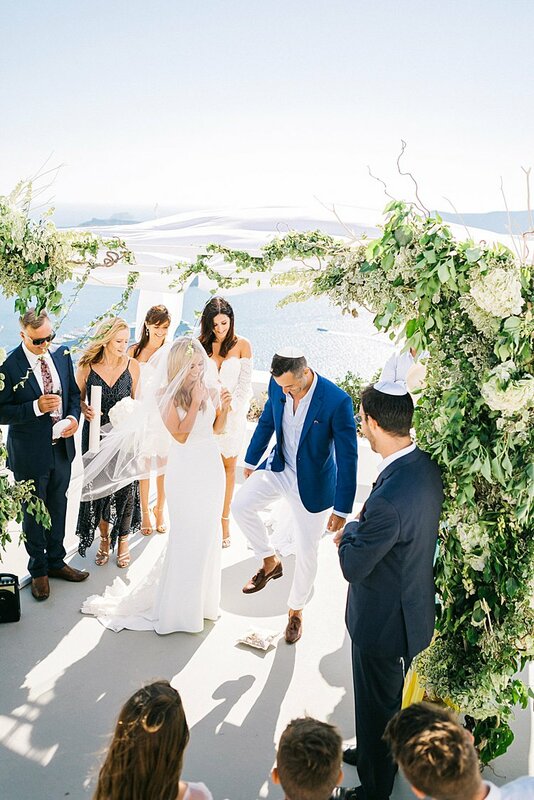 Australian couple Katie, who works in PR, and Aaron, a commercial airline pilot for Virgin Australia, wanted a spectacular backdrop for their once-in-a-lifetime day, and so they chose to marry on the sun-drenched Greek island of Santorini. And did it ever deliver! HannaMonika Wedding Photography’s images from the day are just beyond. Every photo is its own little work of art — and a whole bunch of them could’ve easily been plucked from the pages of a super-glam travel magazine. Take a scroll through, and we guarantee you’ll be fighting the urge to book yourself a ticket on the next flight to Greece. And don’t even get us started on Orriss Films‘ Hollywood-perfect trailer – seriously, Katie and Aaron look like absolute movie stars, and every scene is shot so exquisitely. We just can’t get enough of photographers Hanna and Slavomir’s style: bright and crisp, romantic and modern. They could not have done a better job of capturing the amazing light and colors of Santorini. 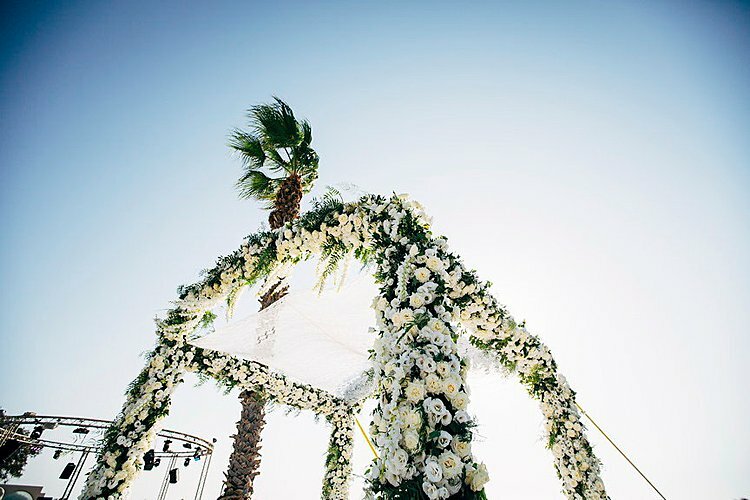 The blue skies, the whitewashed houses, the lush greenery of the chuppah… yep, we’re smitten with this one. Katie, the bride: We met at a pub in Sydney. Aaron saw me with a girlfriend sitting at a table and wanted to introduce himself without being sleazy, so he and a friend asked if we minded if they shared a table with us while they ate their dinner. We said fine, not realizing he had actually already had dinner but ordered a second meal so that he could sit at the table. Slowly they worked their way into our conversations, and soon after he was telling me about his friend that he thought I might like. He handed me a card for his friend if I was interested and that’s when I saw “Aaron” on the card and realised he was telling me about himself, haha. Needless to say I ended up texting him later in the night after a couple of glasses of wine. It took us about a month to finally catch up after that initial meeting because I was being difficult (sorry hubby! ), but the rest is history. I never would have thought that night I was going to meet my future husband. Today’s destination Jewish wedding is serious #chuppahgoals. 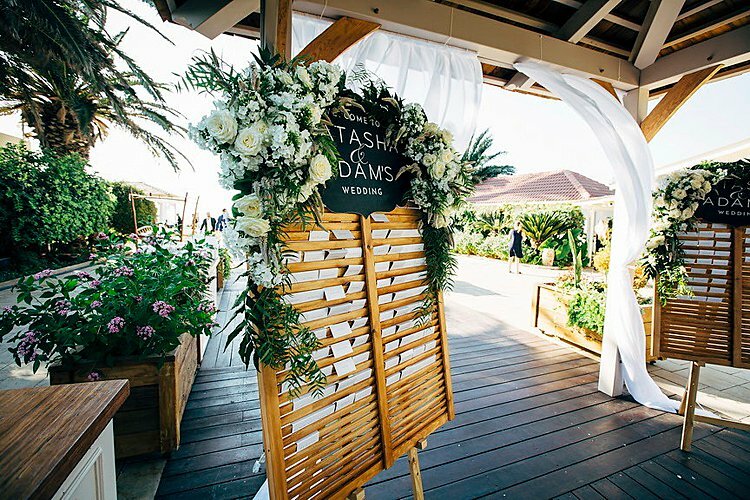 UK couple Natasha, who is a head of sales, and Adam, an investment banker, opted for a destination wedding at gorgeous Al Hayam in Caesarea, Israel. 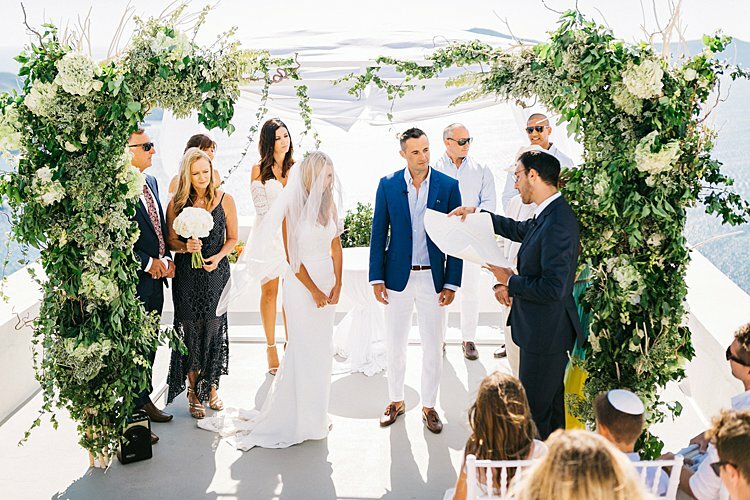 The pair wanted a statement chuppah, but at the same time didn’t want anything to overshadow the jaw-dropping ocean view from their venue — take a look through their photos by STG Fave Ronen Boidek and you’ll see why! 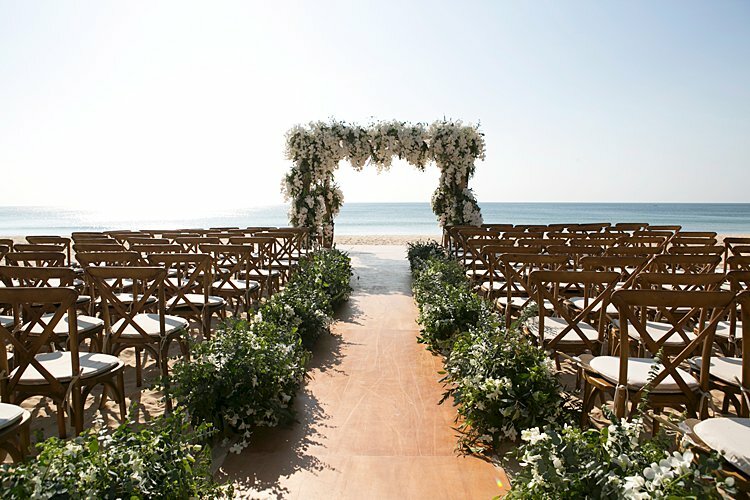 What they ended up with hits just the right balance between luxe and simple: four narrow poles covered in greenery and white and cream flowers, all under a canopy of delicate lace. It’s just so elegant, yet exquisitely delicate at the same time. 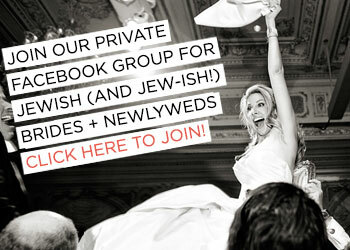 Bride Natasha said she wanted flowers on her chuppah (not only because, well, why would you not?) but also because of all the beautiful things they represent: “life, a new start, and all things alive and living” — all the right notes to hit at the start of your marriage. Though Natasha and Adam went for an elegant classic style, they did bring some quirky touches to their day. 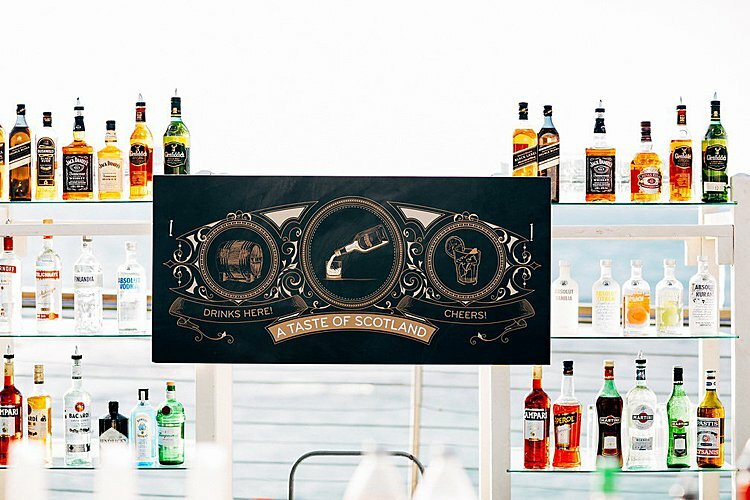 Our favorite: a Scottish whisky bar, in honor of the groom’s Scottish origins, with different types of whisky for guests to sample. 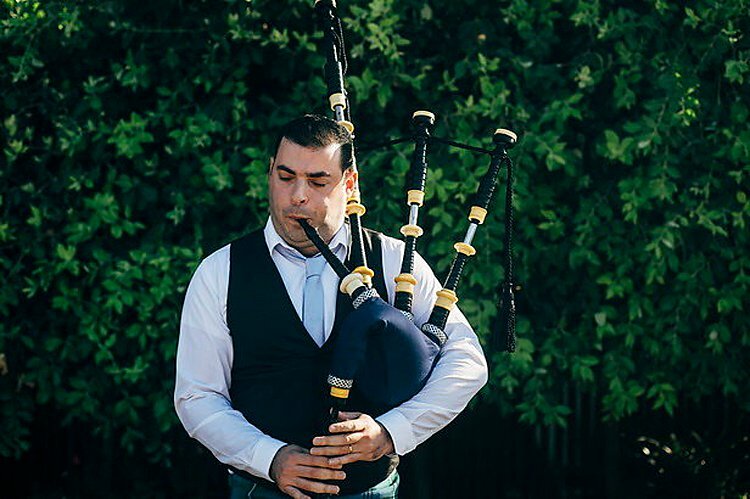 Oh yeah, and there was also a bagpiper in attendance too! Beautiful Natasha, looking absolutely radiant in her ivory lace gown from Paloma Blanca, will fill you in on all the rest of the juicy details… Happy Fri-yay! Natasha, the bride: We got married at Al Hayam, Caesarea, Israel. We picked this venue due to the open nature of the venue, yet somehow it felt like there was a sense of intimacy. The gorgeous view overlooking the ocean was the winner for us! 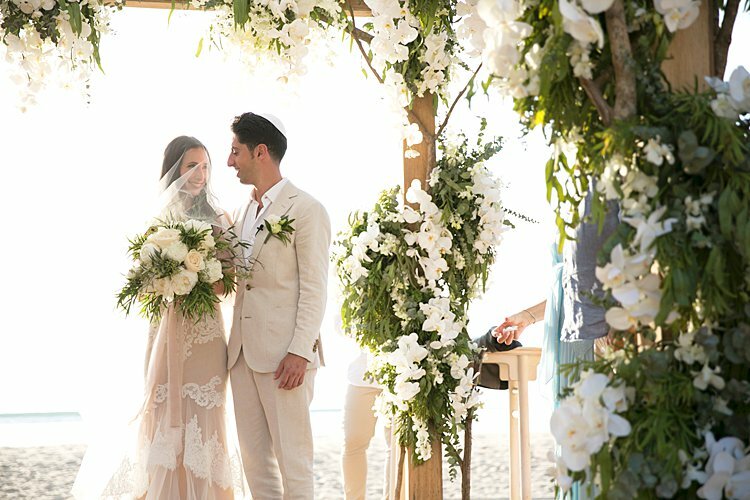 With the help of Luxury Events, today’s bride and groom, Sydney-based Martine and Jarred, got married on the beach in Thailand, and their phenomenal chuppah, draped in boughs of the most beautiful white orchids, could not possibly be better suited to their day at Akyra Beach Club on fabulous Phuket. 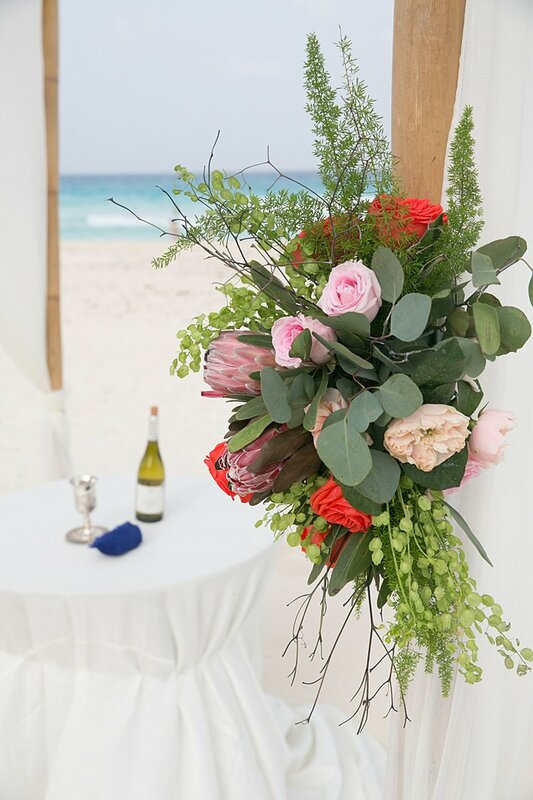 It’s so simple and fresh, so elegantly evocative of the tropical setting — and the contrast between the white flowers and the blue, blue ocean in the background is truly a sight to behold. So is Martine’s gown, from Corston Couture in Sydney. Her ethereally lacey two-piece is wonderfully boho and beachy — and you’ve got to check out the beautiful detailing at the back. That bow! 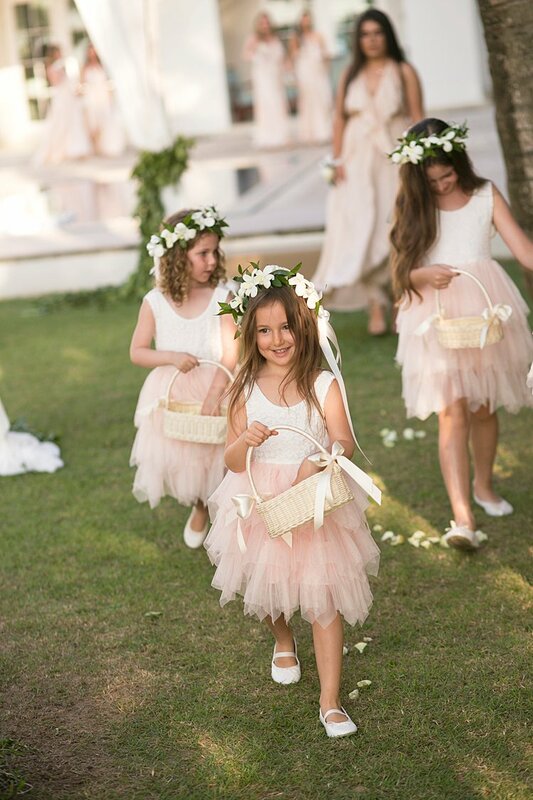 Blumenthal Photography and Soda Films captured all the lovely details of the day exquisitely. 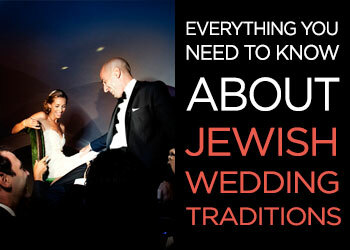 Seriously, check out their close-up shots of the chuppah — and read on for all the details of the day from Martine. Martine, the bride: Jarred and I have known each other for years. We were at primary school together and even “dated” all those years ago (we were 10!) Of course, “dating” or being “boyfriend” and “girlfriend” back then meant smiling at each other but being petrified to speak to one another! â˜º Fast forward to high school, Jarred and I met up again at a NYE party and were set up by my twin sister. We’ve been together ever since (12 years)! That’s us, high-school sweethearts. 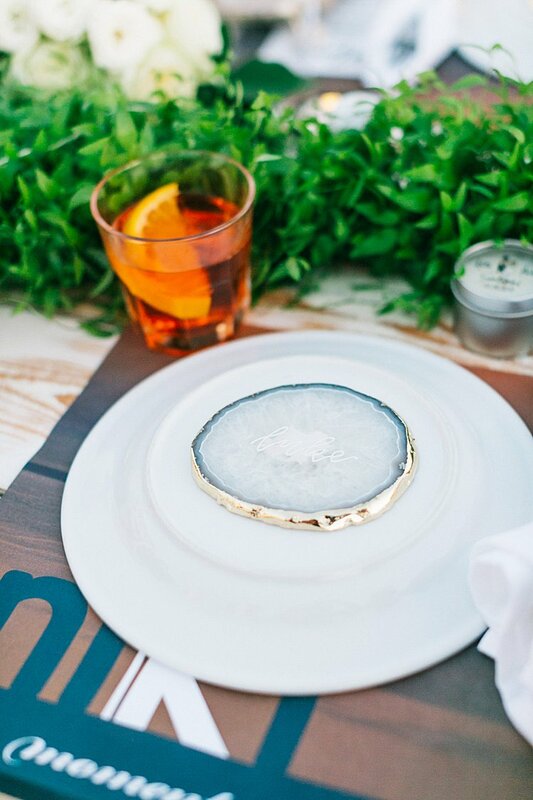 We see a lot of beach weddings at Smashing The Glass, but this one really goes all out with the seaside theme! 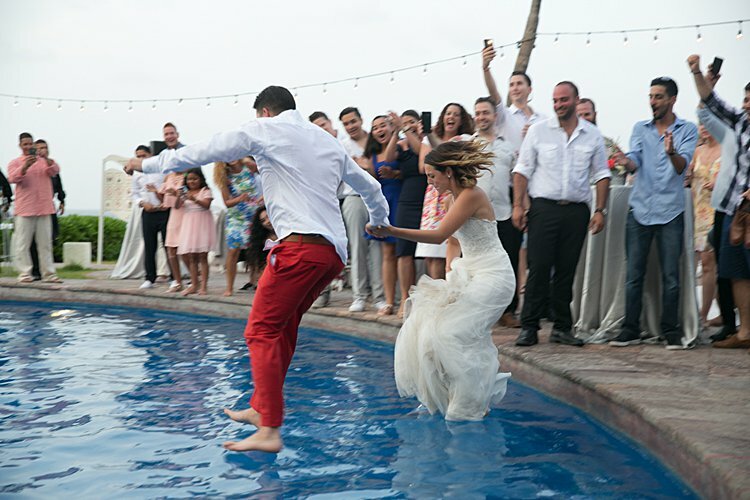 NYC-based Jessica (@jessschein) and Evan (@evanschein) wanted to get married in Montauk in the Hamptons, their go-to weekend getaway from their hectic lives in the city. They chose Gurney’s Montauk Resort & Seawater Spa for its extraordinary views of the ocean — and the stunning sunsets over the water. Totally stunning, right?! Jessica and Evan wanted to keep their day open, airy, and focused on the gorgeous setting. To complement their surroundings, the pair opted for a very nautical white and navy blue color scheme. 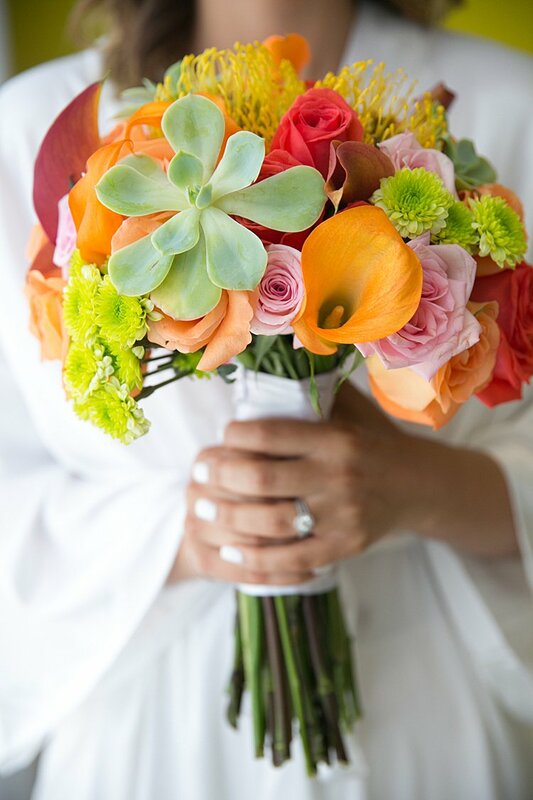 You’ve got to check out their out-of-this-world” blooms all in white — there’s something so dramatic about keeping the flowers to a single color. 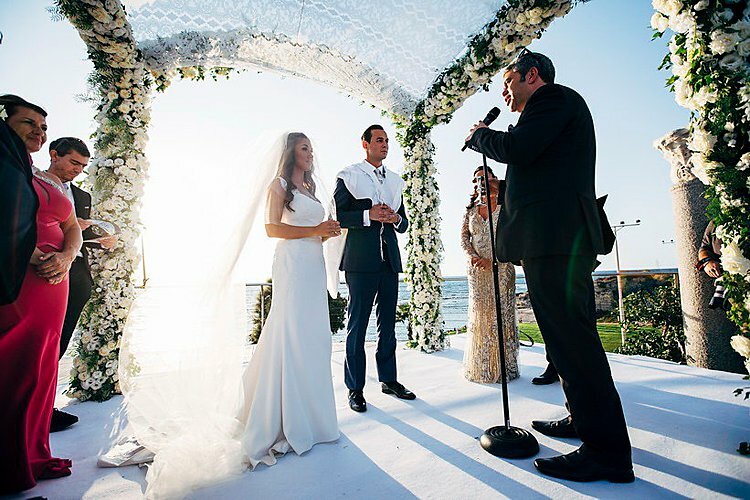 And Jessica and Evan’s chuppah for their outdoor ceremony continued the theme — light and airy, it was adorned with the most beautiful white flowers — hydrangeas, orchids, and more — with sheer white side panels, so as not to interfere with the ocean view in the background. Doesn’t it look romantic against that backdrop? Photographer A Day of Bliss did a wonderful job documenting the day, and the couple sing their photographers’ praises not only for their flawless shots but also for being fantastic to work with on the day. Videographer Keith Brady Media captured the feel of the day perfectly too! Jessica, the bride: “I am so happy my teacher is going to be my Aunt!” — (Evan’s 8-year-old niece, and yes, Jessica’s former preschool student) said, the night Jessica and Evan got engaged. Our story began in October 2012, on a little known dating site, called JDate. However, I was already part of Evan’s family — he just did not know it yet! I came across Evan’s profile, and after going back and forth with the usual 21 questions, we realized it was a very small world. It turned out that I was a preschool teacher at the school Evan’s niece attended. But wait, there’s more… Evan’s niece did not just go to the preschool where I taught, I was actually Evan’s niece’s teacher — 2 years earlier! Evan told me that he needed to get his niece’s approval before committing to a date. (I thought to myself that the chance of going on their first date lay in the hands of a 4-year-old!) As it turns out, I got an A+ rating, his niece saying, “Miss Jessica was the best teacher ever!” This was a fact confirmed by Evan’s brother and sister-in-law, who later admitted they always wanted to set me up with Evan. The rest is history! 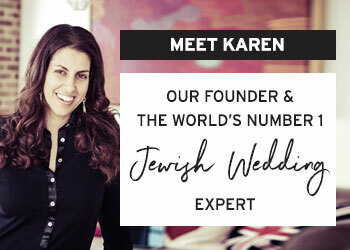 Eden, a kindergarten teacher at a Jewish day school (and a former wedding planner! 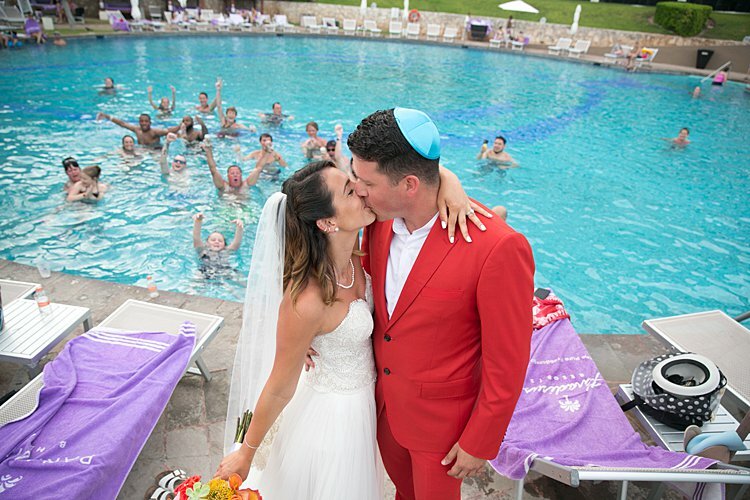 ), and Matan, who runs a construction company, planned a delightfully free-spirited day focused around all the things they love: an intimate day with only those closest to them, a gorgeous beach setting, a rocking party, and color color color–white flowers were forbidden, and groom Matan donned a bright red suit! 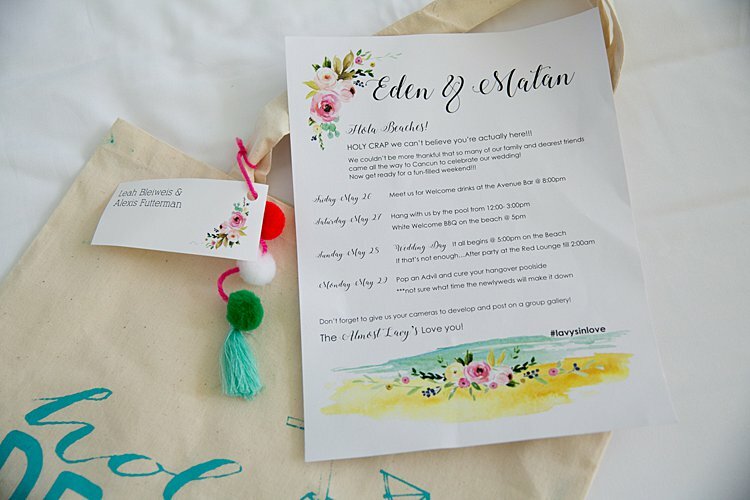 The LA-based couple chose to wed at the Paradisus hotel in the beachy wonderland of Cancun, Mexico, where Eden’s parents were living. In keeping with the laid-back beachy theme of the day, Eden opted for a stunningly simple two-piece gown from BHLDN. 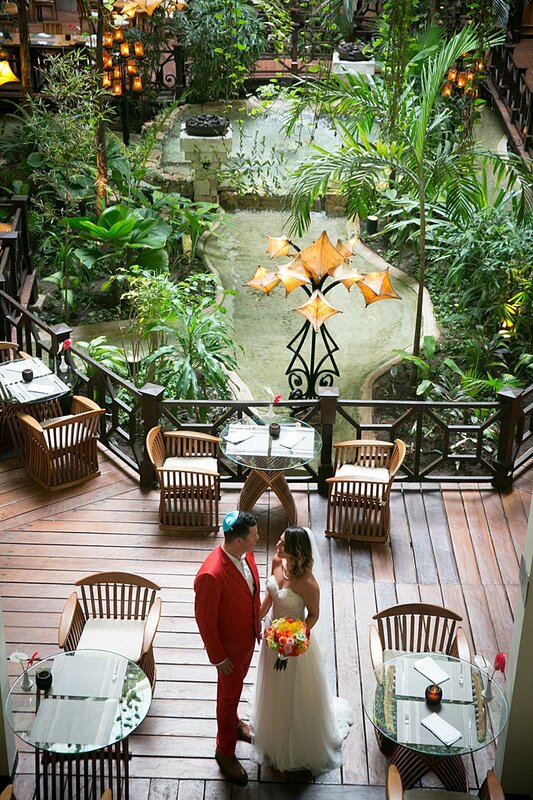 For the full-on tropical paradise vibe, she even went barefoot for her outdoor ceremony. Photographer Michael Segal did such a fab job capturing the exuberance of the day! 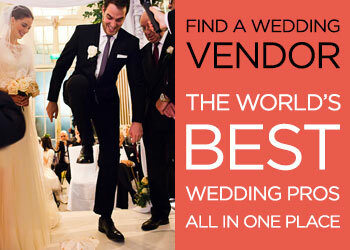 Eden, the bride: You know how sometimes all it takes is a minute to fall in love? Well, for us all it took was some red velvet pancakes on a Saturday morning. I was 20, and definitely didn’t think I needed help from my mom to get a date. So when she texted me “I gave your number to my client with a cute brother,” I was NOT excited. But, I figured what’s done is done — if nothing else it’s a free meal. He insisted on picking me up for breakfast the next day (which at the time was super creepy in my mind but is now the most romantic) and ordered us red velvet pancakes. I guess the rest is history.